was the bleak prospect facing the convoy drivers heading for Gaza. And remember people there were without fuel or power last week because of the blockade. people in Gaza taking action by tearing down the barrier to Egypt so they could stream across and bring back food and other things their families need. I was glad I made it yesterday, after a touch of Winter ailment and some trouble with my feet (don't ask). But at least I can get medication, which many people in Gaza can't. Anyway, before I could congratulate myself, whom did I meet but Mike M., not long out of hospital where he had been undergoing cancer treatment. A native New Yorker and Jewish socialist, he felt he had to be on this demo. "I am starting to feel a bit better now," he reassured me, "and a lot angrier over what's been happening". Our demonstration in the gloom of a January late afternoon in London was part of an international day of action, with events in Rome and San Francisco, and other cities, but perhaps most important at the Erez crossing between Israel and Gaza, with people coming together from both sides of the fence. Having to go on from the demonstration to a social engagement I didn't have time to see if anything of this was on TV. The initiative for the large action that took place today (26.1.08) started when the well-know psychiatrist, Dr. Eyad al-Sarraj, the human-rights activist from Gaza, met in the Gush Shalom office with a small group of Israeli peace activists, in order to tell them about the desperate situation in the strip. It was decided on the spot to organize in Israel a relief convoy for the Gaza Strip people, and to fight by all political and juridical means for the right to get it in. It was agreed that two parallel protest rallies would be held simultaneously on the two sides of the wall. 26 Israeli peace groups joined the initiative, under the single slogan: "Gaza: Lift the siege!" Many activists from different organizations worked day and night. Gush Shalom prepared a special poster and started a fund-raising campaign among its sympathizers. Hundreds of checks came pouring in from Israel and a dozen other countries, enabling the Gush to carry alone the full costs of the supplies. Many added words of thanks for the opportunity given them to express their opinion this way and join the struggle. Warm thanks to all of them! In consultation with Dr. al-Sarraj it was decided to buy not only five tons of essential foodstuffs - flour, sugar, rice, oil, salt, beans and lentils - but also water distillers. "The water in the Gaza Strip is undrinkable," al-Sarraj reported, "therefore there is an urgent need for distillers." The weather forecasts promised rain and thunderstorms all over the country. In spite of this, old and young peace activists came to the starting points in six towns. As requested by the organizers, hundreds of families came in their private cars. Together with the people who came by bus, their number reached about two thousand. "In the night we were woken up by strong thunderbolts. 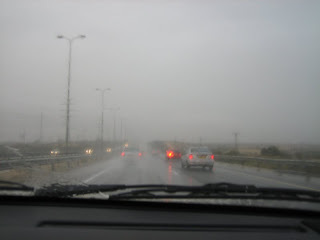 It started to rain cats and dogs, and we were very worried: who is going to get up early on Shabbat morning in such stormy weather in order to participate in an open-air protest rally and carry sacks of food?" recounted one of the organizers. Ya'akov Manor had the idea to ask the demonstrators to bring private relief parcels and to add personal letters "from family to family". The response was beyond all expectations. Families brought not only food and mineral water, but also blankets, warm clothing and many other useful articles, even electrical stoves. The parcels were fastened to the tops of the cars or put in the baggage holds of the buses. They added up to two tons. the huge convoy towards the Gaza strip extremely difficult. About half of the protesters were Jewish, the other half Arab. The rally was conducted the same way: Side by side with the Jewish speakers - Uri Avnery, Nurit Peled-Elhanan, Professor Jeff Halper and former minister Shulamit Aloni (who was ill and sent a written speech, read by Teddy Katz), speeches were made by advocate Fatmeh al-Ijou, and MKs Izzam Mahul and Jamal Zahalke. At the height of the rally, the moderator, Huloud al-Badawi, called Dr. Sarraj by cellular phone. He was participating at the parallel rally in Gaza and his words were conveyed by loudspeaker. They amounted to a stirring call to the Israeli peace camp to support the Palestinians in their struggle against the blockade. A sensation was caused by a young woman from Sderot, Shir Shusdig, who called out: "For seven years I am suffering from the Qassams in Kibbutz Zikim and Sderot. I know that the people on the other side are also suffering very much. That's why I am here!" Jeff Halper mentioned that demonstrations of solidarity with the people of Gaza were taking place in dozens of cities around the world. Advocate al-Ijou pointed out that the Attorney General had asserted in a Supreme Court hearing that the blockade on Gaza was similar to the boycott against the former apartheid regime in South Africa. "This is absurd when it comes from a government which is building apartheid roads all over the West Bank!" Miraculously, the rain stopped just before the rally, and started again a few minutes after it was finished. Since the Israeli army has not allowed the relief supplies into the Gaza strip, they were stored in a neighboring kibbutz. If the military will not permit their transfer to Gaza in the next two days, we shall apply to the High Court of Justice and start a legal fight until we succeed. This siege is continuing in its full cruelty. We will not participate in crime! We are ashamed of the blockade!" In peace, in friendship, in partnership. The threat of Qassams must stop! Because that only leaves us all blind. Yes, yes, even with Hamas! Set up an immediate ceasefire! Make peace with all parts of the Palestinian people! It's the system, wise guys. This Bishop speaks Bosh; Disestablish the Church!